Here’s something I visited one lunchtime this week — Poetry Parnassus. It’s part of the cultural Olympiad and is billed as the ‘UK’s largest gathering of world poets’ — in fact it’s said to be the biggest poetry festival ever in this country. It’s all organised by the South Bank Centre — and there’s plenty of information on their website. There talks and readings by many famous poets, which is all of great interest to someone like myself, who’s dabbled in poetry writing enough to have had some published and be a member of a poetry group (Metroland Poets). 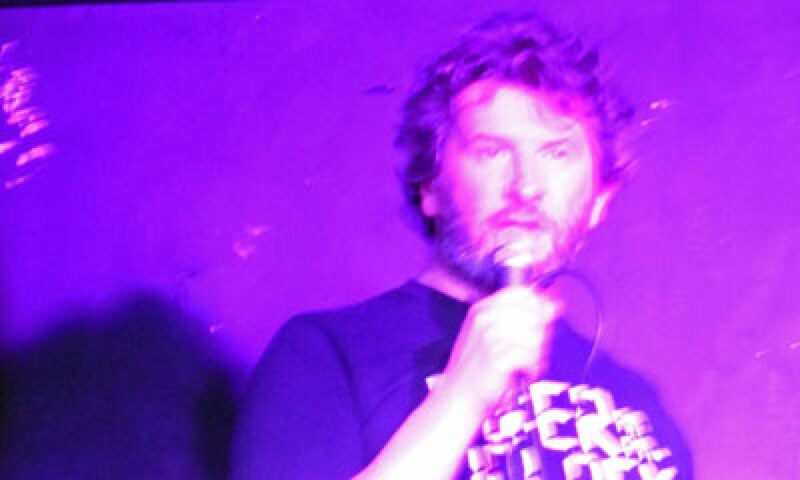 I particularly liked the quirky events held outside the Royal Festival Hall which try to inject a bit of humour into the precious and worthy image that often is unfairly associated with poetry. 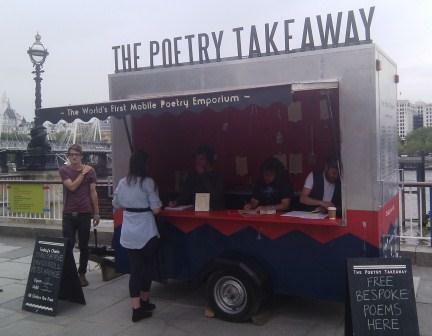 Above is a photo of the Poetry Takeaway — a trailer designed to equate poetry with the sort of greasy kebabs that are sold to hungry, drunk customers from vans late at night in badly-lit car parks. The ‘customer’ queues to place an ‘order’ with one of the three poets ‘serving’ in the van (who can just about be made out in the photo). The poet (and they are relatively well-known poets) takes a bit of information about the person and what subject they’d ordered and the customer turns up an hour or so later to be served with a reading of their personalised poem. All great fun and completely free. Sadly I had to get back to the office before I could order my takeaway. There’s also a Poems on the Underground themed tent (see photo below) cleverly designed like a tube train (not quite convincing enough to believe it’s the real thing — unlike those at Village Underground, which are genuine). I didn’t go in the tent but apparently it holds workshops and events. I went for a run past the Royal Festival Hall a day later and the Poetry Ambulance had arrived on the scene — no photos of this unfortunately — but it’s 60s vintage ambulance of the type you see on TV programmes like Heartbeat. It’s manned by poetic paramedics who will perform life-saving emergency treatment to sick poems — so any blocked bards should get along to the South Bank. Poetry Parnassus finishes tomorrow on the 1st July — I’d recommend anyone with an interest to go along and join in. If the rest of the cultural Olympiad events are as innovative and humorous as the Poetry Takeaway then we should be in for a good summer (culturally at least, if notÂ meteorologically). 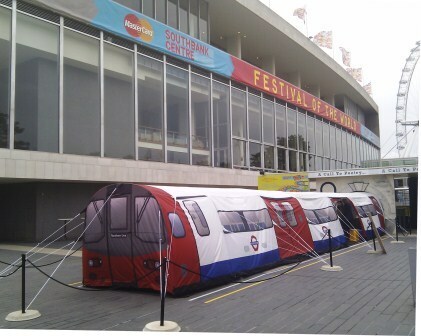 New Temporary Tube Train Drafted in for the Olympics? Or Poems on the Underground? Next PostNext Was It Worth It?